A single Future Shock – notably, long before he got the job as assistant editor. Richard Burton served two stints as editorial assistant (first taking over the slot vacated by Alan Grant, I guess?) before becoming the main editor for a 7-year stretch covering the late 80s to mid 90s. That’s a lot of behind-the-scenes work making sure the weekly Prog is put together on time and in the right order, filled with top content. But, in truth, the man’s legacy is surely always going to be as Tharg’s hapless droid assistant Burt, the supporting player in many of Tharg’s occasional one-off tales. I haven’t counted, but I wouldn’t be surprised to learn that the droid incarnation of Richard Burton has appeared in the comic more times than any other ‘real’ person (Judge Logan, maybe?). 1) Progs 175-349: by almost any reader’s assessment, this is the great Golden Age of 2000 AD. 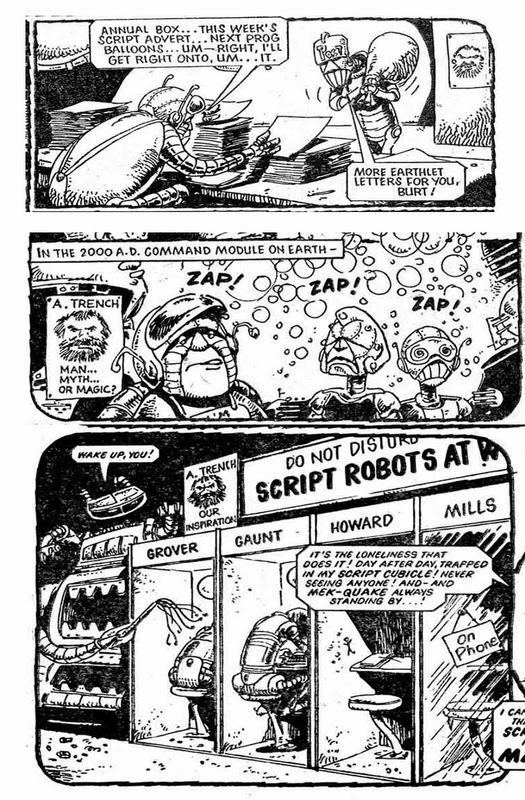 No longer tied down by the forced merger with Tornado (as of Prog 178), the comic was able to concentrate on delivering readers established and unadulterated hits: Judge Dredd, Strontium Dog, Nemesis the Warlock, and RoboHunter; meanwhile, development work lead to the start of many beloved, and long-running, series: Rogue Trooper, Ace Trucking Co and Slaine; all while making space for a solid helping of long-form stories that really hit the spot: Meltdown Man, Return to Armageddon, Harry 20, Skizz. And, capping it all off, it was absolutely the best era for Future Shocks. 'Gaunt' is Alan Grant and Kelvin Gosnell combined. The later round of all-new thrills from Burt, perhaps this time with less Mac intervention? Who knows. But, you know, there's more gold than muck in there. Once again, the talent behind the stories is a key part of all this. Aside from Messrs Wagner, Grant and Mills, there were a lot of new writers making their mark here. On the art side, Carlos Ezquerra, Steve Dillon and Massimo Belardinelli were amongst the few old hands who kept going while a host of new talents jostled for space in the weekly Prog. And perhaps this is where an editor’s whip can be felt most obviously. This may seem a strange thing to assign credit for here, but presumably it was Burton who okayed the ‘Summer Offensive’ project, allowing brash young(ish) things Grant Morrison, Mark Millar and John Smith to fill the Prog with stories of their own devising for a couple of months. Dredd micro-epic Inferno aside, that was a good time to be a reader, and it felt like a true kick up the arse; a lasting effort to push the Prog forward as a vehicle for intelligent exploitation fare***. Arguably things then got worse before they got better (i.e. after Burton had left 2000AD to create Sonic the Comic, something I didn't read but is clearly much beloved by many, and I confess I'm dying to read some of the McMahon and Elson drawn strips), but editorial willingness to give things a go is always welcome. It’s easy to disparage the 2000 AD of this era, but it’s worth remembering that no Prog was a total stinker, and there’s plenty of gold and silver nuggets to find, not all of it from the pens of Wagner, Grant and Mills, either. While I wouldn’t pay for a reprint of plenty of the thrills from this time, I don’t begrudge them the part they played in shaping my tween/teen brain, either. I've just finished listening to an epic 3-part interview with the man, organised by podcasting legends Everything Comes Back to 2000AD. I'd like to think it confirms rather than denies everything I've written above, but then, I managed to spend a lot of words not saying very much, so perhaps it doesn't matter. One of the biggest takeaways for me was that Burton in fact takes credit for a trio of major art finds, all during his tenure as assistant editor - Steve Dillon (RIP), Alan Davis and Barry Kitson. And for that, I'll be forever grateful! 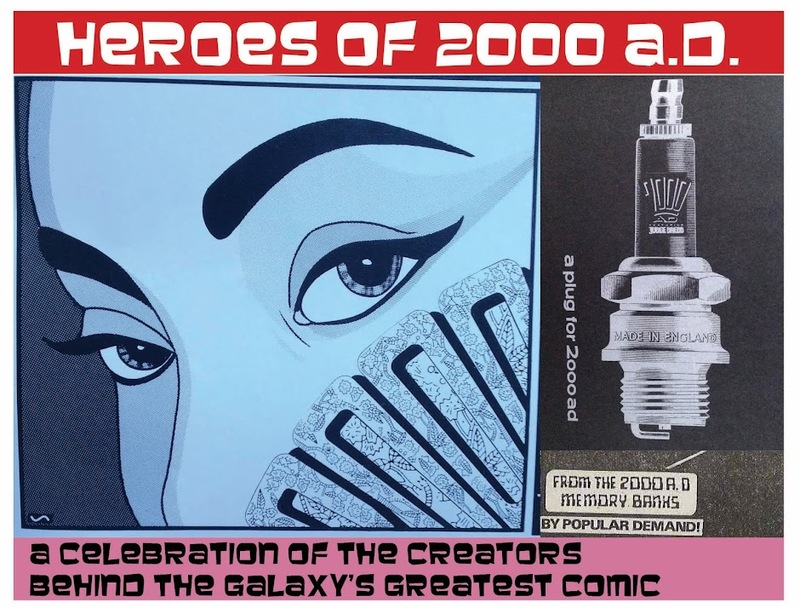 This YouTube clip is fun; thanks to the thrill-powered blog Everything Comes Back to 2000AD for providing the link in the first place. Burton doesn't say much in it, but it's a lovely bit of 1990s history. If you can get hold of a copy, there's a interview with him in Beyond 2000AD from Hibernia press - but it's so out of stock I could only find a listing for it here. His story of meeting Steve Dillon and giving him work for the first time is on the Steve Dillon tribute episode of the Thrillcast. *In fact, this turned out not to be the case! **In both senses of the word juvenile. Sometimes, the comic felt aimed at children, which, being a child, I enjoyed (see: a fair amount of Michael Fleisher’s Friday and the new Harlem Heroes, also Peter Hogan's delightful TimeHouse). And sometimes, the comic felt as if it were behaving like a child – over the top violence with not enough wit to make it work (see: the new RoboHunter; a number of Dredd tales from certain writers). 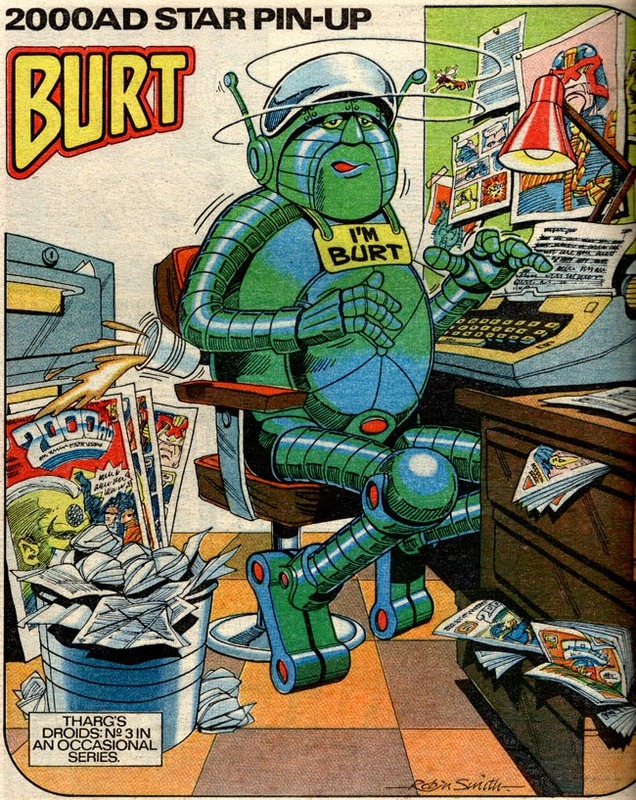 I suspect Burton felt his basic remit was to make a comic for children that many grown-ups also liked, which pulled the Prog in awkward directions ironed out by later editors. -updated to add: Yes, Burton reports that he deliberately wanted to include some stories for 11 year-olds (me), as well as some for the 20-30 age group (most readers). He resolutely maintained the comic as a mainstream publication; something I think it was when he started, but wasn't by the time he left - which says more about the demise of British newsstand comics than it does about his editorial choices. ***Yes, in the end, the intelligent half of this was not much born out of the Summer Offensive - but I believe Morrison and Millar really thought Big Dave was meant to be intelligent, so points for trying. More on this another time.